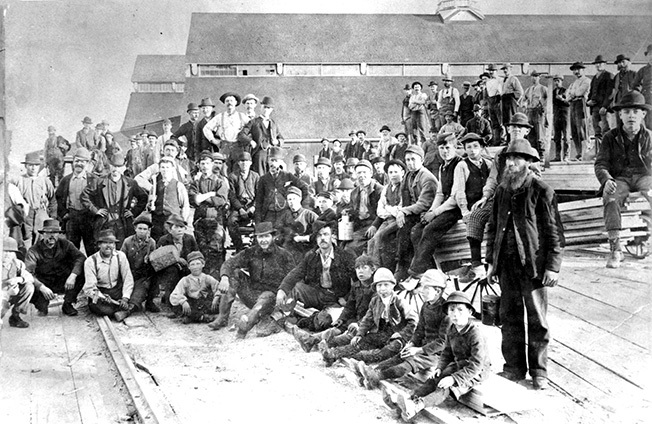 Conroy sawmill employees posing for posterity around 1890. In the background, stand the industrial buildings, in the foreground sit the child labourers of a foregone age. Plan of the Deschênes Mills and Water Power drawn up by Shanly and McCarthy, civil engineers, for William Conroy and his Associates and dated October 23rd 1893. They proposed building a dam and a hydro-electric power station to supply electricity to the Town of Aylmer and to the tramways of the Hull Electric Railway Company. Plunging view of the Deschênes dam and hydro-electric generating station, around 1925. 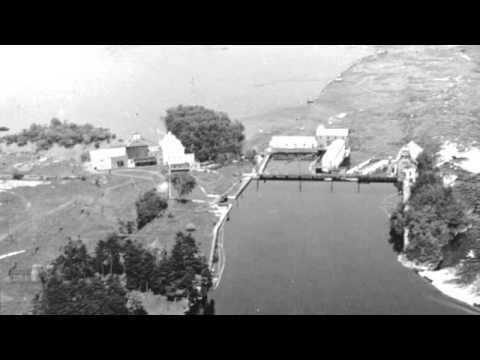 The old Deschênes sawmill and flour mill in 1928. The locality of Deschênes is situated on the North shore of the Ottawa River, at the southern end of the Vanier Road, near Aylmer, in the City of Gatineau. Its name dates back to 1686, the fateful year in which the Chevalier de Troyes went up the Ottawa River and crossed the Abitibi Region with a French military contingent, with orders to launch a surprise attack on the English Forts that stood on the shore of Hudson’s Bay. The celebrated Pierre Lemoyne d’Iberville accompanied him on that campaign (audio). By giving the name Deschênes to the portage path that he and his men walked up to go around the Deschênes Rapids1, the Chevalier de Troyes simply officialised the French equivalent of the name the Algonquin had already given to it. To them, it was Miciminj or a place where oaks grew in abundance. That portage path connected a small bay at the foot of the rapids to another at the head of the portage. It was known as the Portage du Haut (The Upper Portage), or Third Chaudière Portage, and used by travellers until the middle of the 19th century. In 1821, after the amalgamation of the North-West Company and the Hudson’s Bay Company, Ithamar Hubble Day, an old fur trader, opened a small trading post on the Deschênes Portage. He went into business with another petty trader, Murdock McGillivray, and together until 1832 they traded furs in the Allumettes Lake Region and as far up as Lake Timiskaming. Having lost money in his dealings, Ithamar Day broke off his association with McGillivray and left the Ottawa Region2. The McConnell Brothers, who were very active in the timber industry on the Upper Ottawa, took up from where Day had left off and became part-time fur traders on the side. 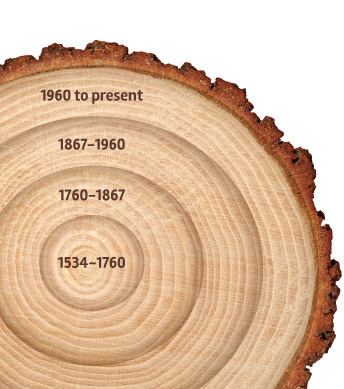 This lasted until approximately 18473. Ithamar H. Day operated a sawmill, a forge and a fulling mill at the Deschênes Rapids around 1828.4Around 1840, Robert Conroy Senior seems to have followed in Day’s footsteps. 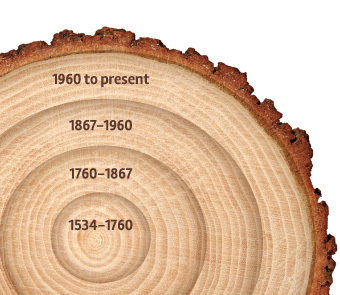 Later on, around 1870, his two sons, Robert and William Conroy, had a large new sawmill built. 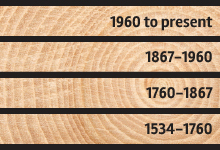 From 1884 to 1888, they carried out improvements to increase the sawmill’s output capacity (image). During the same period, Narcisse Cormier operated a flour mill there. Wheat, oats and buckwheat, harvested by the region’s farms, were milled locally at Deschênes. In 1895, the Deschênes Rapids industrial site was radically transformed. The site’s hydraulic powers were harnessed to produce electricity. The main shareholders of the Hull Electric Railway Company, William Conroy of Aylmer and Mr. Seybold of Ottawa, decided to have a dam and hydro-electric power station built (plan) to supply electricity to the Town of Aylmer and to power the electric tramway network that was being planned to connect Aylmer, Hull and Ottawa. In 1899, the Canadian Pacific Railway bought out the Hull Electric Railway Company and ran it until 1926, when it was sold out to Canadian International Paper (CIP). In 1946, when the Hull Electric Company closed down, the Gatineau Power Company, a subsidiary of the CIP, was in charge of the site’s management. The ruins of the stone walls that still jut out of the foaming rapids of the Ottawa River remind us of Deschênes’ early industrial history. 1 Abbé Yvanhoé Caron (Ed. ), Journal de l’expédition du chevalier de Troyes à la baie d’Hudson, en 1686, Beauceville, La compagnie de « L’Éclaireur », 1918, page 32. 2 Michael Newton, “Some Notes on Bytown and the Fur Trade”, in The Historical Society of Ottawa’s Bytown Pamphlet Series, No 35, page 5. 4 Anson A. Gard, Pioneers of the Upper Ottawa and Humors of the Valley. South Hull and Aylmer Edition, Ottawa, Emerson Press, 1906, page 13. Caption: Conroy sawmill employees posing for posterity around 1890. In the background, stand the industrial buildings, in the foreground sit the child labourers of a foregone age. Source: Pierre Louis Lapointe Collection. 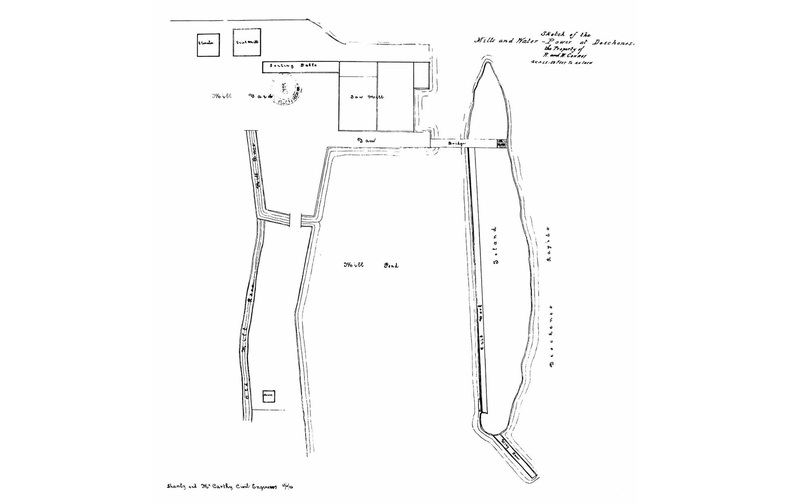 Caption: Plan of the Deschênes Mills and Water Power drawn up by Shanly and McCarthy, civil engineers, for William Conroy and his Associates and dated October 23rd 1893. They proposed building a dam and a hydro-electric power station to supply electricity to the Town of Aylmer and to the tramways of the Hull Electric Railway Company. Caption: Plunging view of the Deschênes dam and hydro-electric generating station, around 1925. 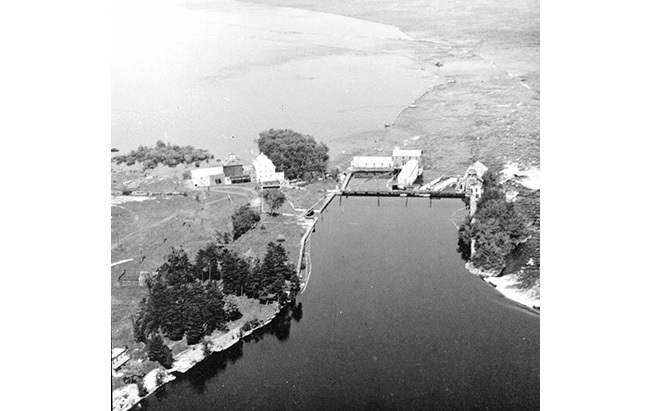 Caption: The old Deschênes sawmill and flour mill in 1928. Source: Abbé Yvanhoé Caron (Ed. ), Journal de l’expédition du chevalier de Troyes à la baie d’Hudson, en 1686, Beauceville, La compagnie de « L’Éclaireur », 1918, p. 32. Caption: The Chevalier de Troyes was the French officer who led the 1686 surprise attack on the Hudson Bay Company’s fur trading posts. The young Pierre Lemoyne d’Iberville accompanied him on that mission. In his journal , the Chevalier de Troyes reported what he had seen and what happened along the way. His description of the Chaudières portages, of the “des Chênes” one in particular, helped to establish the name on the Outaouais map. The same held true, for the “des Chats”Falls name. « On the 21st of April, Father Silvie said Mass, heard Confession and gave Communion to those who still had to do their Easter duties, after which I left to go up to the Chaudière portage, so named by the « Voyageurs » because that part of the River which falls amidst an awful confusion of craggy rocks, throws itself into the hole of one of these rocks shaped like a kettle out of which the water overflows. On the 22nd, I stayed put until I got the rest of the canoes, in one of which I sent four men of my detachment back to Montreal, those who were sick and wounded. 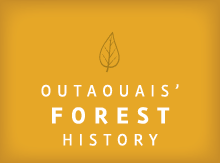 Afterwards, I went up to the portage « des chênes », so named because of the numerous oaks to be found there, a place distant about one league and a half from the Chaudière falls. I encountered many rapids along this route and between these two places I had to walk up a portage which is one league or about from the Chaudière portage and which is one quarter of a league in length just like the one at « des chênes ». Source : Abbé Yvanhoé Caron (Editor), Journal de l’expédition du chevalier de Troyes à la baie d’Hudson, en 1686, Beauceville, La compagnie de « L’Éclaireur », 1918, page 32. English version by Pierre Louis Lapointe.